This item includes the Arizona Sofa Bed Hardwood Frame and our 8 inch Plush Microsuede Futon Mattress in Full size. Optional Drawers are available at additional cost. The Arizona Sofa Bed features flip-up trays on each arm to set your beverage or any item you wish to keep in reach. This futon is easy to operate, and allows you to quickly convert between Sofa, Recliner and Bed positions in seconds. The frame features sofa height seating for optimal comfort. The Arizona Futon Frame utilizes a premium Satin Finish. 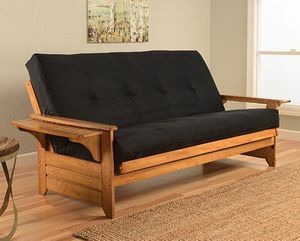 Constructed with 100% plantation grown hardwood, the Arizona Sofa Bed offers the sturdiest and best looking support. This frame is available as a full size in Natural, Butternut, Barbados, Espresso, Black and White finishes.